Ms. Muzzillo lives in Pequannock with her husband Steve and their 2 children, Amanda and Steven. The Muzzillo's adopted "children" include a furry cat and 3 dogs. Sandy loves to cook and garden . 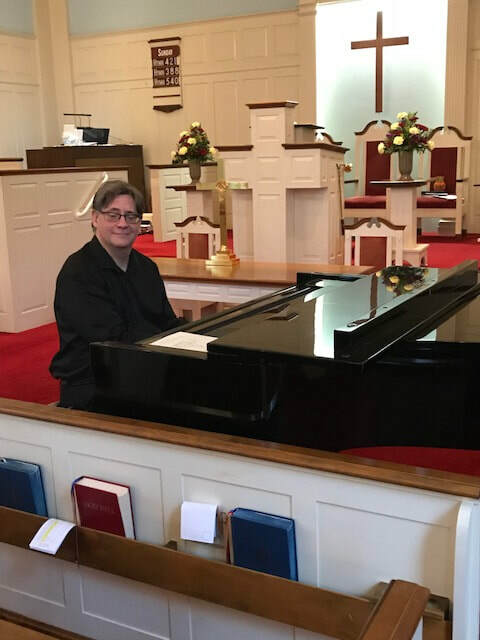 As a member of West Milford Presbyterian Church for 17 years, Chuck Enering has served the Church in many capacities. He has been on the Board of Deacons, Session, Church Sunday School Teacher, Confirmation Leader, Boy Scout Liaison and Vacation Bible School Co-Director. Bringing his willingness to serve as needed, he is now the Youth Director. The goal of Youth Fellowship (5th thru 12th Grade) is to serve the Church-as needed. The Community thru mission projects. The youth thru fun activities. Music composer/improvisor Lee plays keyboards, accordion, sings. He leads the Weekly Reeders, Circo, and Treehouse. He has played with Maria Schneider, Kenny Wheeler, Jimmy Witherspoon, Benny Golson,Terell Stafford, Horacio Hernandez, Greg Bissonette, Steve Houghton, Winard Harper, the late Eddie Harris and many more. He taught at Lawrence University for six years and at Texas Wesleyan University in Fort Worth and other universities. Kathi Enering, Christian Education Director since January 2011 has been a member of WMPC Since 1987. She has served the church as a Deacon, Session member and Sunday School Teacher. She is very appreciative & grateful for all who contribute to the education & nurturing of the children of WMPC. Kathi lives in West Milford with her husband Chuck and 2 Sons CJ and Thomas. She enjoys reading, hiking, gardening and Zumba.